It seems strange to suggest that the side that are the reigning World and European champions have been struggling recently. Eight wins out of eight in qualifying for Euro 2012 further suggest that everything is looking good for the Spanish, who are seeking to become the first team to successfully defend the European title. However, these qualifying results hide deeper issues in the Spanish side. The poor quality of the teams in their group – Scotland, the Czech Republic, Lithuania and Liechtenstein – were never going to serious worry them, and the positive results have flattered them somewhat. It is the friendly results against some of the better countries that will be the worry for Vicente Del Bosque and his staff. In the past fifteen months, they have been beaten by Argentina, Portugal, Italy and England, as well as being held by Mexico and Costa Rica. The only team in the top 25 of the FIFA rankings that they have beaten was Chile, where they were helped by a highly controversial penalty in the 92nd minute. Ahead of the World Cup last year, they had lost once in four years. They have now lost four times in less than a year and a half. Some may suggest that friendlies are not an accurate representation of where the team stand. However, while Del Bosque has been experimenting a little, he has been sending out strong teams in these matches. So where are things going wrong for the Spanish? The majority of the problems stem from an attempt to imitate the style that Barcelona have found so successful at club level. While this may seem an obvious move, particularly given the number of Barcelona players in the Spanish team, they are missing a couple of crucial ingredients. The key ingredient missing is Lionel Messi. Barcelona use Messi in a false number nine role, starting as a striker, but dropping into the hole to drag defenders out of position and create space in behind. However, Spain have struggled to find the right player to take up this role. Against England, he began with David Villa as a lone striker, but soon changed to pushing David Silva into this false nine role with Villa on the wing. The problem they had was that England were sitting deep. David Silva was dropping deep as he was intended to. However, Andres Iniesta was also coming inside looking for the ball and David Villa was unable to get in behind England down the flanks and so was coming inside as well. It meant that all of Spain’s three key attacking players were playing in the same area with little space and England were able to stifle the threat. It was an identical problem to that which saw Switzerland stun Spain in their opening match in South Africa. Spain played too narrow and became easy to defend against. If they are to play in this style, it is critical that the fullbacks provide plenty of width in attack. For Barcelona, Dani Alves and either Adriano or Maxwell do this job excellently. However, again the problem is that they are not Spanish. Against England, Spain played Jordi Alba and Alvaro Arbeloa in these positions. Normally Sergio Ramos would play on the right, but due to the continuing injury problems for Carles Puyol means that he is playing centrally more often than not for Spain. Whilst Arbeloa is a solid fullback, he is not exactly an attacking wing-back and while Alba is a good player, he is still young and has a long way to go to replace the hugely underrated Joan Capdevila. It means that Spain struggle to get the width from their front players and do not cover that with the fullbacks. One player that was missing against England was Barcelona’s Pedro Rodriguez. Pedro is one of the very few top class wide forwards that Spain possesses. He knows how to play that role, providing width when needed, but cutting inside to devastating effect. The other problem that Spain have is a lack of players running forward from midfield to give the defenders something different to worry about. They tend to play their traditional passing football in front of the defence, looking to pass their way through, rather than getting runners forward from midfield. Against England, they had Xavi and Xabi Alonso as the two midfielders, both of whom prefer to sit deeper and orchestrate the play from there. It means that England could sit back and mark the three attackers, cutting off the options, knowing that they would not have to worry about either of those two making runs beyond the strikers. The solution to this could be Fabregas, who has been excellent in this role for Barcelona this season. Playing a very different role to that at Arsenal, he has thrived, scoring five goals in nine league games already this season. That is already more goals in a season than all but two of his years at Arsenal. In the last ten minutes against England, he dropped deeper and starting making these runs into the box and it was no surprise that he caused England all sorts of problems. He arguably had Spain’s two best chances of the match in this period and really should have scored. However, at least he was getting into these positions, which Xavi and Alonso would never have taken up. The final player who could play a key role for Spain is Fernando Llorente. He provides the one thing that none of the other Spanish strikers has. He is a big physical presence and gives Spain another option. It is a similar criticism that Arsenal have faced for years – when the passing game is struggling, they have no target man they can bring on to mix things up. Whilst it failed, Barcelona even tried the same thing, bringing in Zlatan Ibrahimovic to provide a different option up front. Llorente has proved that he can score goals at club level – with Athletic Bilbao, he has hit double figures for each of the last four years and has started this season in good form. Llorente would allow Spain to play more direct when the situation requires it. Against England, Spain brought on Fernando Torres to try and play a more direct game. However, against the big English central defensive duo, Torres struggled to win anything in the air. Llorente would have been a completely different proposition. One major negative that I believe that Del Bosque has copied from Barcelona is playing David Villa out of position as a wide forward. In the big games in both the previous two tournaments that they have won, Spain have been very dependent on the goals of Villa. 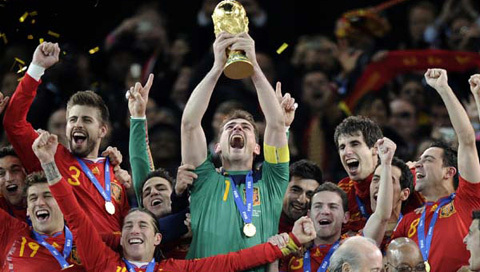 In Euro 2008, Villa scored four goals – twice as many as any of his teammates – to clinch the Golden Boot. In South Africa, David Villa scored five of his team’s eight goals in the tournament to become joint top scorer in the tournament. By playing him wide left, you are taking away a great deal of his goal-scoring threat. Last season, despite playing at Barcelona, he scored his third lowest total of goals in the past ten years. With the goals of Lionel Messi, it is not such an issue for Barcelona. However, for Spain, they do not have a Messi, meaning that goals are becoming harder to find. In their four matches against teams ranked in the top ten in the past 15 months, they have scored only twice. Spain have the problem that they have too many similar world-class players and in trying to accommodate them all, they are becoming easy to defend against. Sergio Busquets is a crucial player in the defensive position that Marcos Senna perfected at Euro 2008. However, ahead of him, you have the likes of Xavi, Xabi Alonso, David Silva, Andres Iniesta, Juan Mata, Cesc Fabregas and Santi Cazorla all battling for places ahead of him. Xavi and Xabi Alonso seem to be automatic choices, which leaves the others battling for the three spots. However, if you fill all these three spots with those players, Spain become very one-dimensional. For me, David Villa has to play as the central striker. Pedro Rodriguez must be a definitely starter, either on the left or right attacking position, while it would seem logical that Andres Iniesta should play the other side – he is far too talented to leave out. Behind him, I am not convinced you need both Xavi and Xabi Alonso. They are incredibly similar players and while they are both top class players in their own right, they perform the same role. Virtually every side is going to sit back and defend against Spain, so with Busquets in the team, you don’t need two central midfielders sitting deeper as playmakers. I would keep Xavi in the side, but bring in Fabregas alongside him. Fabregas will make the forward runs to worry the defence that Spain do not currently have. He can also play the role that Xabi Alonso currently plays, so Spain would not lose anything were they wanting to continue playing the same style that they do now. Clearly, I am not suggesting that Spain drastically change their style. It has brought them incredible success and that is no coincidence. However, in the past fifteen months, they have taken the slow passing approach to new levels. There is no drive and directness in their play. It is easy to defend against them and they play very narrow and pass in front of you. Adding Fabregas provides the direct midfield running, Pedro (or Jesus Navas, who was a key player in the World Cup success) would add width to stretch defences, and having Llorente as an option on the bench would allow them to switch to a more direct approach if they need to chase a game late on. Spain will still go off as favourites to retain their crown, but I feel that unless they change something, they may struggle against the better teams in the tournament - against the likes of Germany, Holland, Italy and even England.